Crista Rizzuti, left, and Lizette D’Amico at New Canaan High School. NEW CANAAN — When asked to describe what her position entails, Crista Rizzuti took a moment to ponder. D’Amico, the administrator for world languages and the ESL departments, nodded in agreement as she glanced at the files on her desk. 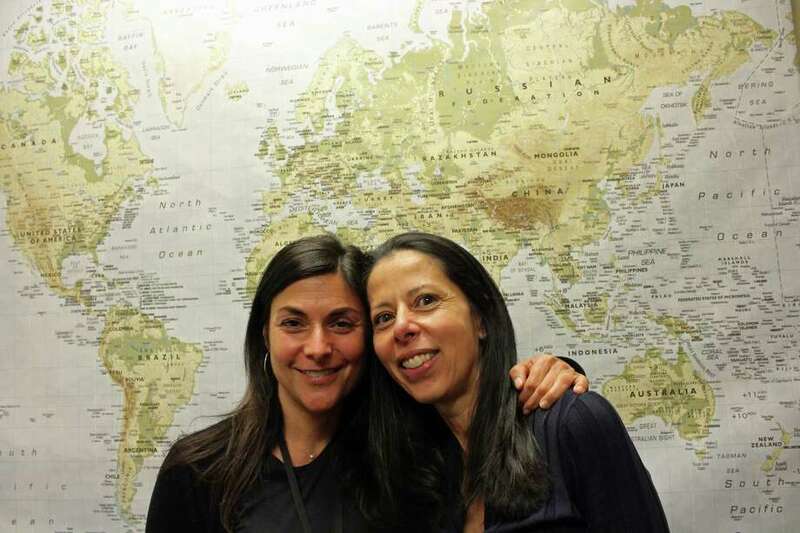 In their roles, the duo helps ESL students transition into New Canaan schools. Some of these students have had prior studies in English while others arrive knowing no English at all. “We’re usually running around the different schools. Sometimes we’ll bump into each other throughout the day and sometimes we won’t be able to connect until 10 p.m.,” D’Amico, 49, said. D’Amico started out as a dual-language teacher in the Rochester City School District in New York before going to Stamford, Greenwich and eventually New Canaan. Rizzuti focused on teaching Italian and Spanish, weaving through different school districts in the Bronx and Bedford Village in New York, and Stamford. “We definitely have the experience,” Rizzuti said with a smile. D’Amico, whose office is decorated by a wall-sized map of the world, said there are 59 ESL students throughout the five New Canaan public schools. “The ESL population in New Canaan has grown. These students take a home language survey when they arrive to the school district and we work with an individual plan from there to assist them,” Rizzuti said. Stamford schools, which are more diverse and have a larger ESL student population, have the staff and personnel numbers to accommodate them. New Canaan public schools, on the other hand, have recently created Rizzuti’s position to help students transition into their new environment. “If you think of the typical New Canaan student, you have an image in your head. When we started to get different types of students who didn’t fit that mold, we needed someone who understood that child and that family and help them fit in and be happy,” D’Amico, a New Canaan resident, said. The students in the New Canaan public schools system come from all over the world. Rizzuti and D’Amico, with almost 20 years of combined experience in New Canaan schools alone, have built an informal network of contacts that allows them to connect families in similar situations with each other. “There is no set protocol to this, but over time you meet different people and they will reach out if you put them in touch with people who are undergoing a similar situation,” Rizzuti said. One way or another, both teachers have found ways to connect students from similar backgrounds. While the teachers acknowledge they play a small part in the growth of ESL students, they credit the children’s work ethic and effort despite being in a wholly new environment. “When you move into New Canaan and don’t speak English, you really have to work at two or three times the pace than the other person who has always lived here,” D’Amico said. Making sure the kids are happy and taking advantage of the opportunities the schools provide is the most important thing, the instructors said. “You share part of those small moments and small victories,” Rizzuti said.